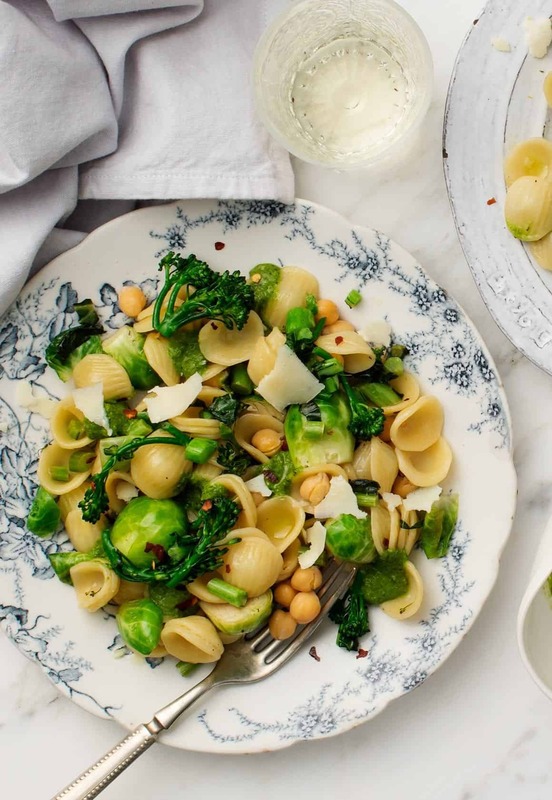 Make this vibrant, veggie-studded pasta as part of our 5-day meal plan or on its own. A dash of white wine makes it a delicious weeknight go-to. Happy Saturday and welcome to Day 4 of my meal plan week! In case you haven’t been following, here are Day 1, Day 2, and Day 3. Once again, I’m trying something new this week where I’m posting easy real-life meals where one meal leads into the next, making cook/prep time a breeze. This is the way I love to cook – it’s fun, it’s flexible, and I hope this helps inspire your own meal planning. 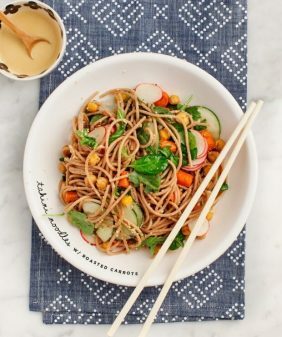 And speaking of meal planning, here’s a shameless plug for our new meal journal, The Love & Lemons Meal Record & Market List which is a handy tool to help you organize your meals. Now that we’re later in the week… pasta!! Why? 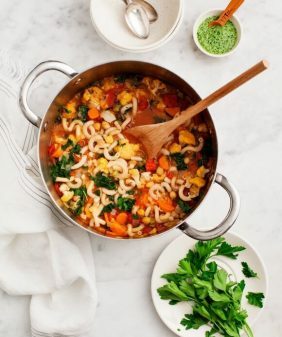 Because pasta is fun and it’s the perfect vehicle to use up bits and bobs of leftover vegetables. I also saved a trip to the store because I always have pasta in the pantry. 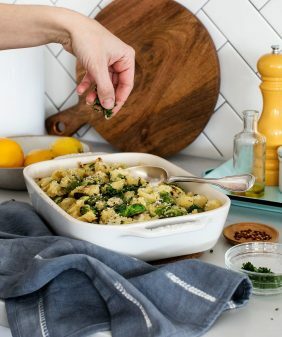 BUT a humble, back-of-the-pantry pasta becomes less ordinary with an awesome green sauce – the creamy kale pepita pesto that I had on hand from the beginning of the week! A fancy sauce really makes any meal more fun. So that’s it! Another dinner, made in less than 20 minutes. Of course, this is super flexible based on the vegetables you might have on hand. It can be made vegan by skipping the bit of cheese. It can be made gluten free if you use gluten free pasta. 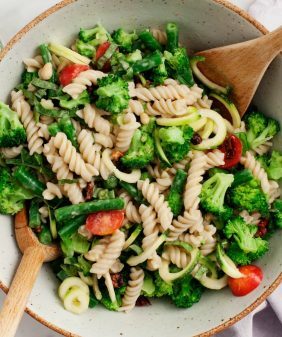 This simple vegetarian weeknight pasta is studded with veggies and gets lovely flavor from white wine. 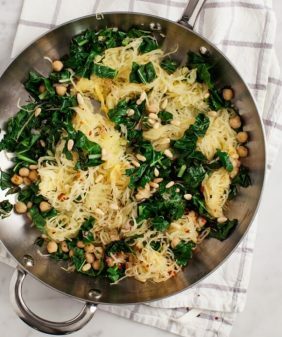 Skip the cheese to make it vegan, and use gluten-free pasta to make it gluten-free. Bring a large pot of salted water to a boil and prepare the pasta according to the package directions, or until al dente. 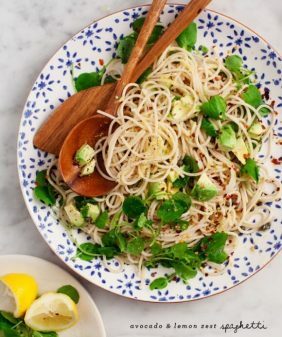 Drain the pasta and toss it with a drizzle of olive oil to keep it from sticking together. Return the empty pot to the stove and let it cool slightly. Coat the bottom of the pasta pot with a generous drizzle of olive oil and heat to medium heat. 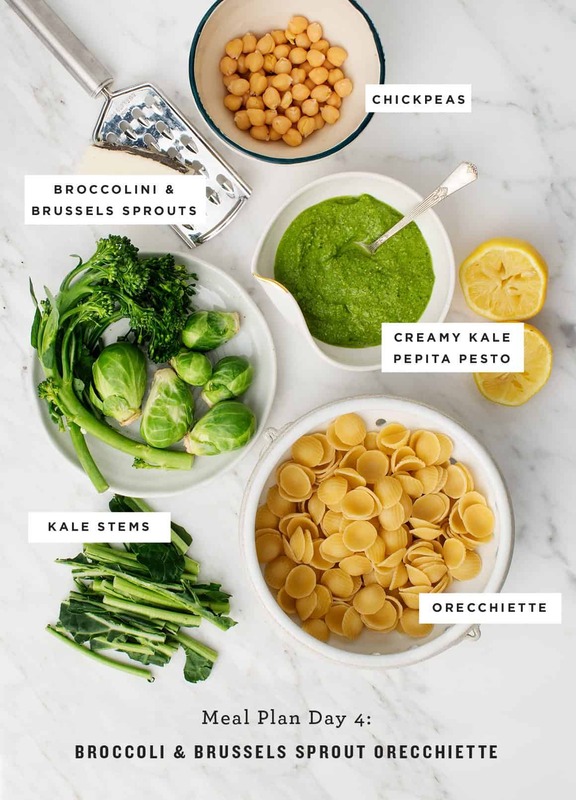 Add the Brussels sprouts, kale stems, broccolini stems, and a pinch of salt and cook until nearly tender, stirring occasionally, about 10 minutes. Add the broccolini florets and cook until the vegetables are all tender, 3 to 5 minutes more. Add a splash of wine and stir to loosen any bits that might be sticking to the bottom of the pot. Cook for 30 seconds, then reduce the heat to low. Stir in the pasta and the chickpeas and cook stirring gently, until just heated through. Season with more salt and pepper, to taste. Transfer to plates and serve with generous dollops of the pepita pesto and shavings of pecorino cheese, if desired. *If you're following the 5-day meal plan, be sure you have a few tablespoons of sauce left for the next recipe (the cauliflower soup). If you're running low, stir in a bit more olive oil to make the sauce stretch further. This looks too beautiful to eat but I will! Yum! I just got my Echo Dot and set up Alexa and you are under the food section. And you have a five star rating! Congratulations! I can’t wait to ask Alexa to go on Love and Lemons! Food sounds yummy and look fabulous!! My thanks for doing such a good job.